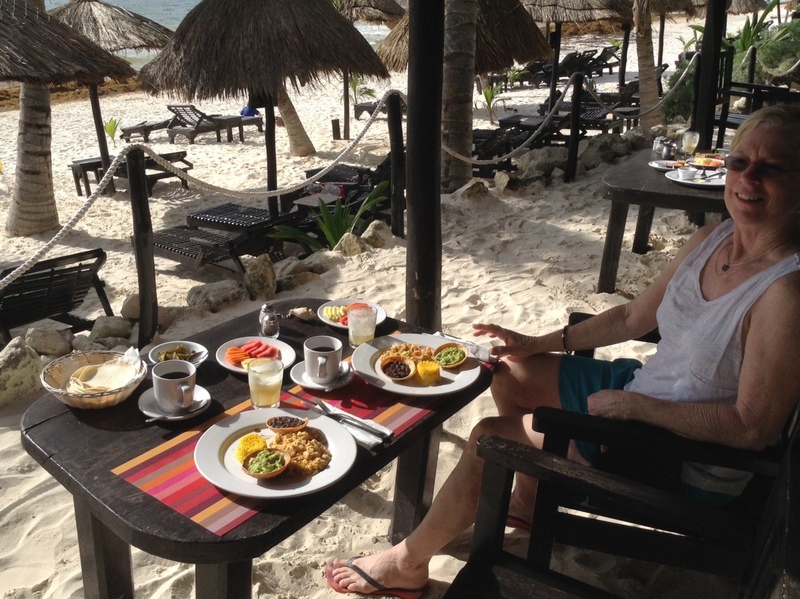 After our week-long stay in Playa del Carmen, we rented a car and drove an hour south to Tulum. The hotel we had booked was right on the beach and offered small yet comfortable bungalows. The room came with breakfast. It was served in their restaurant on the beach. We had our choice of an American style pancake breakfast, a fruit and yogurt one or a Mexican breakfast. We always chose the Mexican style. But we saved the Coronas for later in the day. For the most part, we really took the time to relax around our lovely beach setting. We enjoyed going into the town center of Tulum, where we had lunch. On another day, we drove around to research which other activities we were going to do. An iguana getting some sun on the roof of the bungalow next to us. A full moon lit up the sky. In the previous blog, I chronicled my diving adventure in a cenote. Diane, during that time, went on her own excursion to Sian-Ka'an, a nature reserve right along the ocean that is run by the local Muyil community. Sian-Ka'an is a UNESCO World Heritage Site. 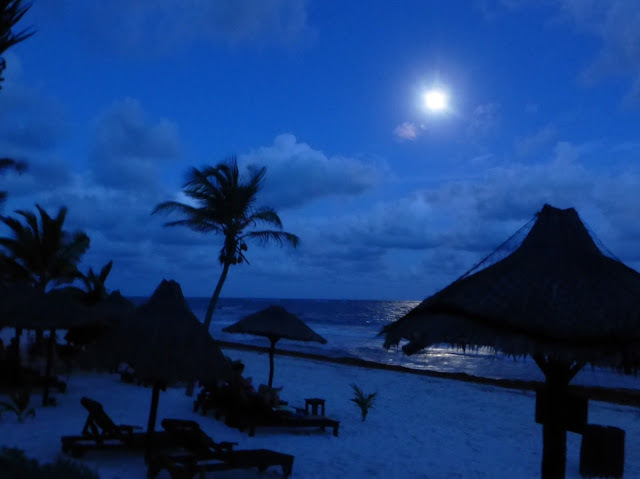 In Mayan, Sian-Ka'an means the "Origin of the Sky". 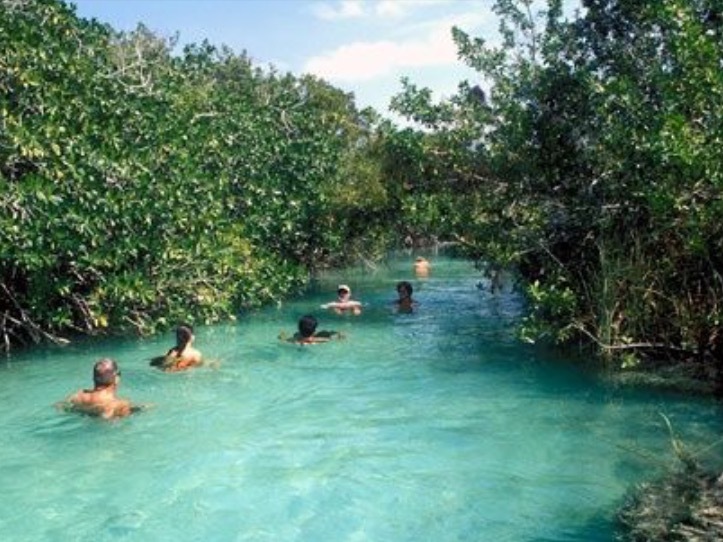 It has dense rain forests, mangroves and marshes and is home to howler monkeys, pumas, ocelots and jaguars. Birders enjoy the reserve because it offers sightings of hundreds of bird species. Sian-Ka'an also has a number of Mayan archeological sites. Under the watchful eyes of Muyil guides, the reserve offers activities such as floating down mangrove-lined waterways, boat excursions and forest treks. Groups float along the mangrove-lined waterway. The float lasted about 30 minutes. I could have kept going much longer! The water was crystal clear, warm and so relaxing. Diane at one of the Mayan archeological sites. A view of the reserve's dense jungle from one of the platforms. A view from the dock.